The Canadian Journal of Exploration Geophysics was published by the CSEG in print form from 1965 to 1999. The CJEG was placed in abeyance at this time due to the significant cost of time and money necessary to produce a high quality, refereed publication. 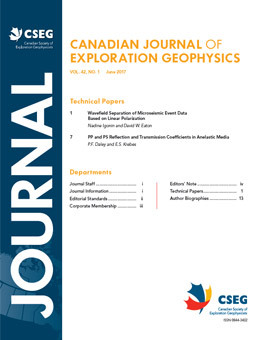 However, the CSEG (in 2010) has resurrected the Journal as a digital on-line publication, maintaining it's high quality refereed nature. If you wish to submit a paper for this new version of the Journal, please contact Larry Lines (lrlines@ucalgary.ca) or Satinder Chopra (schopra@arcis.com) for more information. Copyright © The Canadian Society of Exploration Geophysicists (CSEG). Some Rights Reserved.